Vinyl flooring is durable, easy to clean, and very affordable. 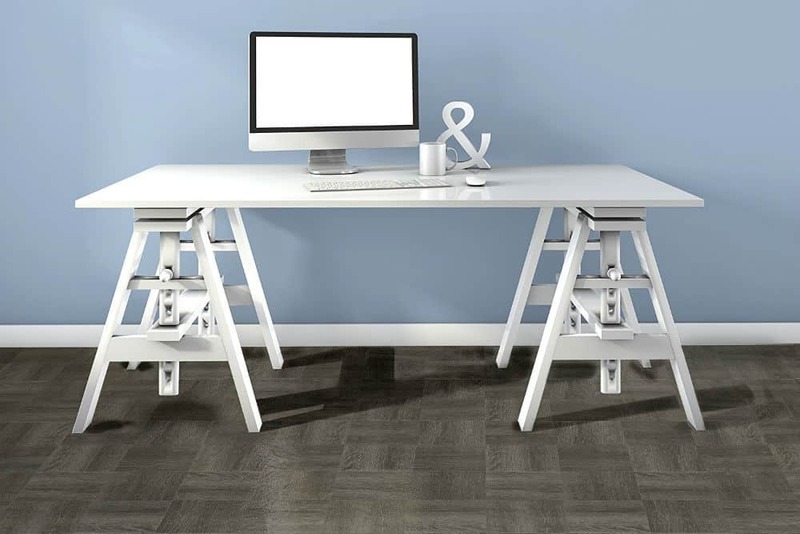 It is a popular and solid choice for any kind of home or office space. Vinyl is most frequently used in kitchens and bathrooms, but some buyers like having it in every ​​​​​room. Home Adviser called vinyl flooring a synthetic cousin of laminate floors Like laminate, vinyl is resistant to stains, and durable even in high-traffic areas. Another huge benefit to having a vinyl floor is that it is absolutely water-resistant, and does not get damaged even by prolonged exposure to moisture. 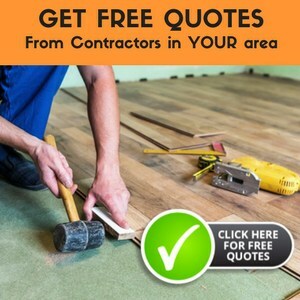 Remember to check out our wood flooring reviews which highlight the best choices for this year! There is one notable reason to avoid this product: Kryptonite Farmwood Luxury Vinyl Plank Flooring is currently out of stock with all major retailers in the US. Here is a wood look for anyone looking to replicate an imposing dark brown laminate. Dark farm wood is a great option for anyone who likes a rugged or rustic look. This product might be the best vinyl wood look flooring choice for buyers who want a cozy but outdoorsy effect. Sheet dimensions for Kryptonite Farmwood Luxury Vinyl Plank Flooring are 6.3’’ x 48’’, with a thickness of 3 mm. The product comes with samples and glue. This is an antibacterial flooring option, which makes it a good choice for clinic waiting rooms, kindergartens, etc. Kingsport Flooring also offers matching, custom-made unfinished stair treads and architectural moldings, fit to their buyers’ specifications. 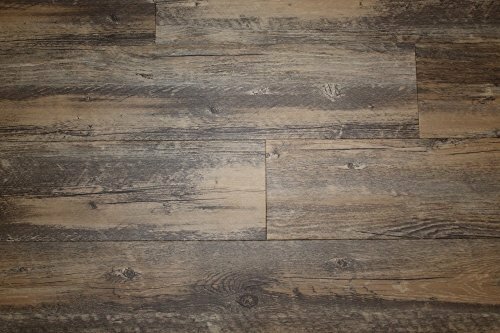 You might be able to find it on eBay, but if you want a quick and simple online ordering process, Kryptonite Farmwood Luxury Vinyl Plank Flooring is not the best vinyl wood look flooring option for you. If you are daunted by the potential messiness of using glue, self-adhesives are definitely your best bet. If you like to set your floor down yourself, and you’re hoping to do it with no fuss, Achim Home Furnishings offers the best vinyl wood look flooring option for you. These tiles are very easy to set. Just peel off the protective layer and stick the tiles down neatly, and you’ll get a lovely smooth effect. The Achim Home Furnishings Nexus Self Adhesive comes in 12’’x12’’ charcoal gray wood tiles. Each tile is 1.2mm thick, and has a 0.1mm wear-layer. The tiles are matte, they do not come with a wax finish. If you want to make a badly-lit room look brighter, this is a good color choice to go with. The charcoal gray is professional-looking, elegant, and bright. But for buyers looking for a more natural look, this is not the best vinyl wood look flooring choice. The color might look too cool and might clash with real wooden furniture. The parquet pattern might not appeal to some. It is important to note here that this product contains chemicals known in the state of California to cause cancer, or birth defects or other reproductive harm. If you want to add an air of luxury to your home, US Window And Floor USWF15 Classis Vinyl Planks are the best vinyl wood look flooring choice for you. These glue-down planks are 6’’ x 36’’ in size, and 2 mm thick. There is a 0.15 mm wear layer, for extra durability. US Window And Floor Classis Vinyl Planks come in a beautiful silver oak, with a very realistic stained wood texture. It is a warm, rich color, which will match any style of furniture, from metallic modern designs to old-fashioned elegance. This vinyl is a great choice for any home, as well as for offices, waiting rooms, even grocery stores. If you love the look of hardwood, but you do not want to deal with a high-maintenance, easily damaged floor, this product is absolutely the best vinyl wood look flooring for you. It is worth noting that US Window And Floor Classis Vinyl Planks are in a higher price range than comparable products. They are also shipped without glue- make sure to calculate that in if you are budgeting. But if you can afford them, the high-quality and luxurious design makes US Window And Floor Classis Vinyl Planks a really good investment. Come in a beautiful silver oak, with a very realistic stained wood texture. If you have decided to go with vinyl, you will find an incredible variety of styles to choose from. Wood look is a popular design choice for vinyl floors. It can evoke the elegance of laminates, or even copy the restrained beauty of hardwood floors. The best vinyl wood look flooring brings a natural beauty into your home. According to Flooring Inc, wood look vinyl flooring is a top 2017 trend. The rising popularity of vinyl floors caused a sharp rise in quality and variety as well. Vinyl is the most affordable flooring option, but it varies in quality and style. If you are looking to buy wood look vinyl, you might feel overwhelmed by the huge number of choices available. This article looks at some of the best vinyl wood look flooring on the market. Take the time to find the right option for you. Since vinyl is extremely durable, you will be stuck with the same floor for a long time so you should make sure to choose the right fit for you and your home or professional space. An overview of three leading products reveals that US Window And Floor USWF15 Classis Vinyl Planks are the best vinyl wood look flooring choice for most buyers. Evoking silver oak hardwood, these planks are classy, and they are a great fit for any home or professional space. They come with a wear layer, protecting them for getting damaged in even the highest-traffic settings. If you prefer a more rustic look, and do not mind having to go through alternative suppliers, Kryptonite Farmwood Luxury Vinyl Plank Flooring could be the best choice for you. If ease of installing is your main concern, you might want to go with Achim Home Furnishings FTVWD22920 Nexus Self Adhesive 20 Vinyl Floor Tiles. The best vinyl wood look flooring is durable, easy to install, and it looks both impressive and elegant. All three reviewed products fit this description. You will get quality and a great visual effect from whichever one you choose.